All is well, so let's look at the patch notes. 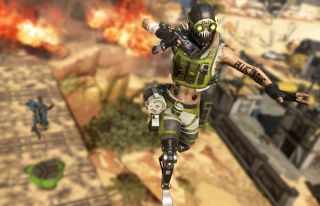 "Everything you've accomplished and bought in Apex up until the 1.1 Patch that went live at 10:00 PST today should be restored," Respawn said. "Any in-game purchases and progress acquired during the time between 1.1 going live and the fix will be reverted - levels earned, items unlocked, packs opened, and spent currency. If you continued to play and didn't patch then this will not affect you. Any currency purchased, spent or not, will be carried back over to their original account state. i.e. - if you bought $20 worth of coins, and spent $18, then you’ll will get $20 after the fix." As for the actual patch notes, I think the new "Last Squad" option is the big one for me. More than once I've finished a pickup match with friendly, easy-going, skilled players, and thought to myself, "I'd really like to play with them again—if only I could remember their names."